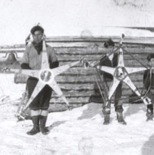 In this special presentation of Ancient Faith Radio, Father Paisios DeLucia interviews Native Alaskans on Kodiak Island about the Alaskan Orthodox Christmas practice of Starring, a tradition in which the faithful follow a brightly decorated, spinning star with an icon of the Nativity at its center. Father Paisios DeLucia interviews Leonti Wasli and his mother Olga about the Native Alaskan tradition of Starring. Father Paisios DeLucia interviews Stephanita Wood about the Native Alaskan practice of Starring.